So, I'm trying not to really overanalyse this, because the email that came in was really simplistic in nature. It almost leads you to instantly draw the conclusion that ... "zOMG, if you use a bigger screen you'll burn through more data!" I remember a couple headlines a few years back that was trying to draw that parallel by saying that "bigger screens have more pixels, more pixels means more resolution you'll have to download", which is just laughable in about the most laughable ways. But you read a little more and it does take a little bit of a level head and understand they're trying to say that "if you have a bigger screen, chances are you probably bought it so you can use it/read it more often, and doing so you use more data each and every day". Who has phones that are under 4.5???? If you do, chances are it's a flip phone or it's so old that you hardly ever use it. I'm wondering what the sample size is, and the distribution of screen size over that sample size. In the end, please don't think that just because your screen size means you'll burn more data. As always, take everything you read on the internet with a grain of salt. 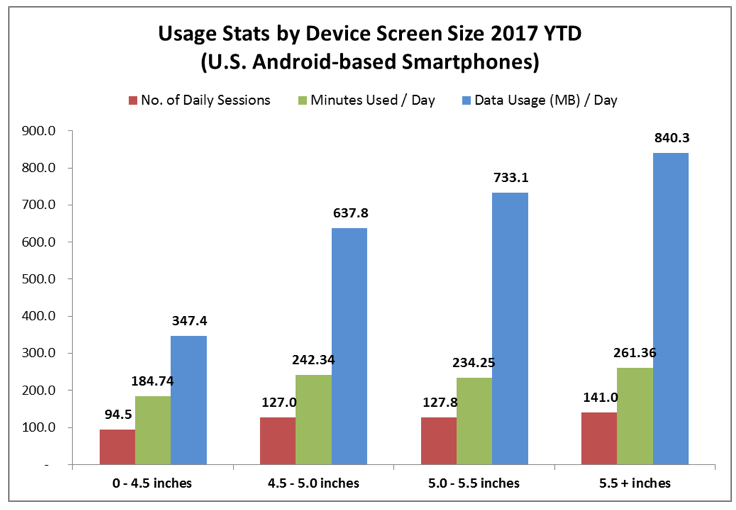 Mobile screen sizes are getting larger, but the impact on data use and minutes have not yet been quantified – until now. AppOptix, a division of leading analyst firm Strategy Analytics, monitors a consumer mobile research panel of more than 4,000 individuals on Android devices. Their recent data shows that 5.5+ inch screen sizes have data and minutes of use patterns that exceed those of smaller screened devices. In fact, AppOptix data shows that 5.0-5.5 and 5.5+ inch screens are using 3x and almost 4x the cellular data compared to 4.5-5.0 inch device screens. The data clearly indicates that larger screened devices play a role in the rising consumption of data, minutes, and sessions. Consumers are engaging their devices and network operators should consider and plan for this growth in data consumption as we expect the number in data, minutes and sessions to only grow over the next few years.